The first thing you probably want to know about Facebook’s new “tag suggestions” — which uses facial recognition technology to suggest which friend is probably featured in which photo — is that you can turn it off. Anticipating the inevitable freakout that accompanies every Facebook change, the world’s largest social network is giving users an ample heads up — tag suggestions isn’t available now, but will be rolling out across the United States in the following weeks. Now if you upload pictures from your cousin’s wedding, we’ll group together pictures of the bride and suggest her name. Instead of typing her name 64 times, all you’ll need to do is click “Save” to tag all of your cousin’s pictures at once. By making tagging easier than before, you’re more likely to know right away when friends post photos. From the Account menu in the upper right corner of your profile, chose Privacy Settings. Scroll down to “Things others share” section. From the “These people” menu, you have the option of choosing who can see photos via your tagged name. You can set it to “Only me” or you can add specific Facebook friends who are permitted see those photos via your tagged name. Here, you also have the option of preventing specific Facebook friends seeing photos via your tagged name. Save this option. As with other Facebook privacy settings, you can change it at any time. You just have to do it. Helen A.S. Popkin is always going “blah blah blah” about online privacy, then she asks you to follow her on Facebook and/or Twitter … because that’s how she rolls. hoho.. yet another privacy issue on fb. but seems like everyone likes it. so there’s no issue on this i guess. anyhow i need to ensure myself will not be tagged unnecessarily.. haha.. article from Technolog. haha nice.. facebook friends with parents? 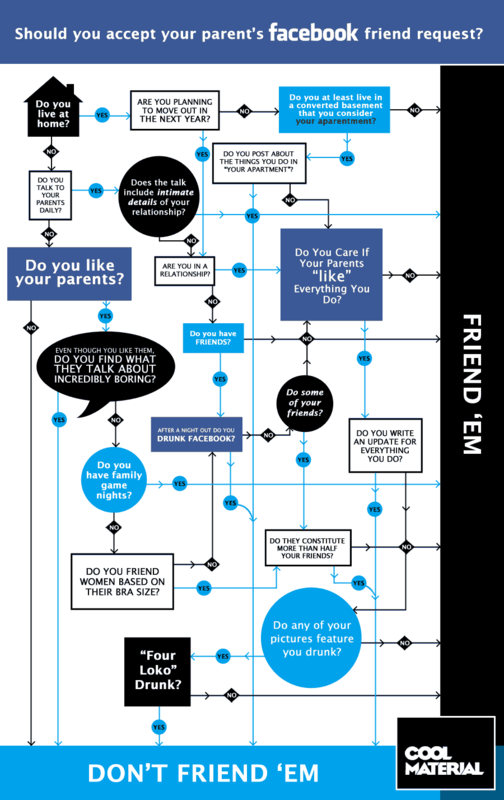 Gizmodo gave out this flowchart to help you out.. thanks! *Take pictures and videos on your phone, then upload them right to Facebook. *Send messages or call people in your Friends list. *Manage your profile and post anytime, anywhere. downloaded this facebook app for windows mobile. it’s nowhere near iphone’s fb app. the main page took quite some time to load. and the photos are almost not available. when someone commented on a status, i can only view the latest. i can’t view its threaded comments. i must say it should be better..
perhaps an update from microsoft might improve this app later. All those features we went over in our Xbox 360 update impressions post are finally rolling out to everyone on November 17. Facebook – Update your status to share what movie, game or entertainment you’re enjoying, connect with friends and view their Facebook stream, status updates and photos on the big screen – all seamlessly integrated and custom-built for Xbox 360. You can even compare your Xbox LIVE and Facebook friends lists to see which of your friends are on LIVE. Twitter – Stay in the know by discovering, posting and replying to Tweets right on your Xbox 360. You can even view friend profiles, trends and conversations, or search to see who’s tweeting about your favorite game. In addition to these social features, Xbox LIVE will also be debuting “News and More,” a new section of the “Inside Xbox” channel, transforming Xbox LIVE into a full-fledged media portal. With a regularly-updated stream of content from MSNBC, The New Yorker and Dilbert, “News and More” brings the latest in current events, arts and entertainment right to your fingertips. i posted yesterday on facebook on PS3. now Xbox 360 confirms the Facebook integration next week. with these features you can have almost all media-capable with just a console nowadays. what else can consoles give? i’ll be on Facebook more frequent next year i guess.. (same statement when Sony announces Facebook integration on PS3). i haven’t join Twitter so that might not be too useful for me. Zune and Last.fm sounds interesting but would it be good here in my beloved country with this kind of internet service? i might need to wait for the whole day for a movie to be fully loaded and visible. else i would have to wait few minutes after every 10 minutes of video streaming. haha.. a question of internet service here.. article from Gizmodo. That’s a nice selling point you had there for a few weeks Microsoft. Looks like it’s not going to remain exclusive for long though, as rumours mount that Facebook will join the realm of Playstation 3 features with the next Firmware Update. Images were originally posted by ScrawlFX, clearly showing Facebook integration aswell as coloured trophy cards and tidier photo browsing. At first we would have said “Photoshop(! ),” but the fine folks at ScrawlFX have noted the images are also currently uploaded to uk.playstation.com’s website. Obviously we’re not meant to see these yet. But we have, so all we’re left questioning is – why the hell is Facebook access hidden in the “Account Setup” area of the XMB. Could this be some sort of trophy interaction used in conjunction with your Facebook profile? And why are the images in Spanish on uk.playstation.com’s website? ahah.. facebook on PS3? good news then.. i don’t have to open up boot my PS3 to Yellow Dog Linux just for Facebook.. can’t wait for this to come.. i’ll be more active on facebook after this.. 😉 rumor from PushSquare.